The UFC 218 main card is packed with fan-friendly contests, but Tecia Torres and Michelle Waterson could set the bar too high as the opening fight on the PPV. There are several bouts that are expected to be electrifying contests at UFC 218, but one that is lost in all the hype is the strawweight fight that will be opening up the main card. Top contender Tecia Torres will be meeting Michelle Waterson in a bout with major title implications in the first fight of the pay-per-view. At the beginning of 2017, Michelle Waterson was on the fast track toward stardom. She was coming off a high profile victory over Paige VanZant in what was the most watched UFC on FOX card to date. More high profile opportunities followed as a result: Waterson appeared as a guest analyst on FS1 and would even attend New York Fashion Week on behalf of the UFC. After being out of action most of the year with injury, “The Karate Hottie” was suddenly everywhere and a bout with Joanna Jędrzejczyk for the belt seemed inevitable. Just as quickly as she ascended, however, she vanished. In April, she was stopped in decisive fashion by current champion Rose Namajunas and has not fought since. The fight with Torres at UFC 218 is a chance to not only come back, but put her right back on the short list for title contention. Torres is a top-five opponent and a victory over her puts Waterson in talks for fights with similarly ranked contenders like Felice Herrig, Carla Esparza, and others. While a rematch with Namajunas is not likely with a victory, she would keep herself in the top five. It’s a feat that isn’t easy to achieve considering the shark tank that is the strawweight division. Coincidentally, Tecia Torres has been on a path almost parallel to Waterson in the same span. After coming up short on The Ultimate Fighter to win the inaugural championship, she recorded two UFC victories, including one over future Invicta FC champion Angela Hill. When she met Namajunas last April, the bout appeared for all the world to be a title eliminator. With Jędrzejczyk in the midst of tearing through the division, Torres and Namajunas had set themselves apart going into their bout. The fight was a competitive, back-and-forth affair in which Namajunas prevailed. Torres, similar to Waterson, would not compete for nearly a year until this past February when she defeated Bec Rawlings. Torres followed up that win with a submission finish over Juliana Lima in July and now has an opportunity to become one of the few fighters to notch three victories in the UFC in 2017. 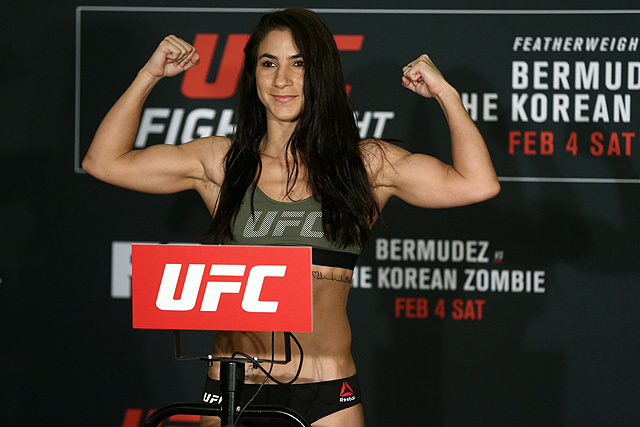 Tecia Torres is currently ranked number five in the UFC rankings and is an easy sell for a title shot. She is 1-1 with current champion Namajunas and both fights were exciting contests. When looking at the division, Claudia Gadelha is coming off of a loss and Karolina Kowalkiewicz is 1-2 since her own win over “Thug.” With the exception of a rematch with Jędrzejczyk or a fight with Jessica Andrade, “The Tiny Tornado” is the logical third in line for a title shot should she defeat Waterson. Physically, the two are very evenly matched. In her UFC career, Michelle Waterson has been the noticeably smaller and shorter athlete in the cage. Against Torres, however, she will actually be the taller opponent. “The Karate Hottie” is a well-rounded mixed martial artist but her best strength is on the ground where she can use her grappling to smother Torres and neutralize her explosiveness. For Torres, her versatility poses a big threat as she is known for being able to keep up a frenetic pace for all three rounds. She can look to maintain a high volume on the feet and overwhelm Waterson or push her against the fence and work for a takedown. Despite being physically even, Torres has appeared to be the stronger of the two when comparing them against similar opponents. On the ground, the key will be to maintain top position and break down Waterson systematically with strikes until she opens herself up for a submission. There is no timetable yet on what is next for the strawweight title fight. A rematch between Namajunas and Jędrzejczyk next year appears to be the next step, but Tecia Torres could elbow her way into the title picture should there be a delay. Michelle Waterson could find herself ahead of the pack with a victory as well, likely setting up a potential title eliminator against Carla Esparza, Cynthia Calvillo, or Felice Herrig. There are three female matches on the UFC 218 card, but Torres and Waterson are on the PPV portion for good reason: they have just as much potential to steal the show as any fight taking place that night.